I have many memories of Easter as a kid in New Jersey. Most of them pleasant, but a few of them, well … not so good. I still remember the feeling of dread when looking at the Catholic Mass calendar on the refrigerator and realizing I had to “serve” on early Easter morning. Growing up Irish Catholic, I served as an altar boy until my cassock (those catholic dresses for boys that apparently were a turn on to priests) was well above my knees! I realize that the dread I felt was not so much serving mass—I somehow enjoyed the altar-eye view, the participation in the event, and the opportunity to ring the bells—but the double whammy of having to serve at 7 am on Easter Sunday and to serve with Father Murphy. I know that Jesus was always awake for the 7 am mass, but getting up at 6 am on a Sunday was torture for a pre-teen. However, the big issue was Father Murphy. He was one of those old school priests who never heard the song “if you’re happy and you know it, then your face will surely show it!” I always had to be on my A-game with Father Murphy who would notice and publicly scorn every altar boy infraction! (Someday, I will blog on “calling” and how Father Murphy played an important part in that process of my life). Suffice it to say, Father Murphy taught me to fear God and he literally scared the Hell out of me! Ironically, the other two priests in our parish were so much fun to serve mass with, one even drove a Mustang Convertible and sang all the time and the other could have been Friar Tuck’s stunt double in Robin Hood. Reflecting on the contrast of childhood Priests now coincides with my year-long journey through the Chronological Bible (I am currently deep in the heart of Chronicles seeing the Father Murphy God) and Francis Chan’s Crazy Love Bible Study which asks in Chapter 4 – “Do I really believe that God loves me?”. The reality is one who does not look beneath the veneer of the Bible would think that there is an incongruent dichotomy between the smiting God and the Loving Father. The reality is that this seeming incongruity merged on the cross. Today, in a post-punitive Christian culture with the theological pendulum swinging towards a kinder, gentler God where love is winning (which in many ways is a good challenge for the finger wagging crowd), it seems like some of the pre-cross characteristics of our Holy God are being muted. As we end another Lenten season, once again we are reminded that the wrath of God for our sin is poured on the cross, where His son took our place. Easter celebrates a new covenant, a New Testament, a new day – but God has never changed – He is Holy, Just and Loving all in one. Hope springs eternal and Spring, specifically Easter, brings eternal hope. It is the season of second chances – sins atoned for and complete redemption for all – therefore there is no condemnation! Easter allows us to celebrate the amazing reality that in Christ we are given a second eternal chance! I was recently reminded of this truth after a Phillies Spring Training game in Clearwater Florida. 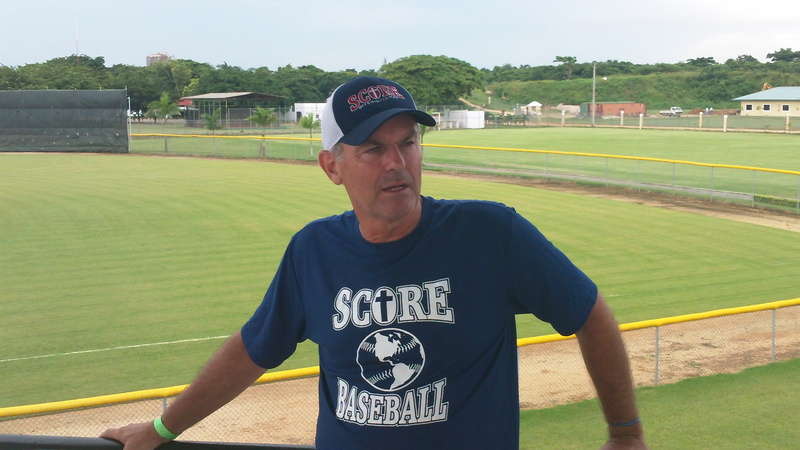 If you know me, I love baseball, I love emerging adults, I love the Dominican Republic, and I love Jesus and because of that I love the SCORE International Baseball Ministry. This March during Spring Training, I was able to introduce some friends to Keith Madison (Baseball Director of SCORE) while at a Phillies vs. Rays Spring Training game. One of the joys of the trip between games we were able to listen to Coach’s old baseball stories. He shared this one with us that screams of the coexistence of a punitive and loving Father who kept His integrity of who He was because of what was done on the Cross – wrath poured on Jesus, sin paid for, death conquered, grace abounded and love offered. Who would have thought that all that could be found while serving mass and attending a ballgame! Be a dispenser of God’s love and Grace and leave the condemnation there on the cross! He is Risen … Happy Easter … and keep up the great work! To read the full story that Keith Madison told us click on this link. Beautiful Dan! I was actually confirmed Catholic the week before Christmas. I am in love with the Catholic church!